"... a gem to be cherished"
Synchronicity strikes again. Here, on the heels of Marco Longhini’s beautifully boxed set of Gesualdo’s secular madrigals (see my review above), is a release of the composer’s sacred music. As annotator Glenn Watkins puts it in the booklet, Gesualdo’s sacred music fell completely into oblivion. Watkins surmises that part of this may have been due to the fact that very few copies have survived, indicating (to him) that the print run may have been very small to begin with. Yet there may also be the barrier to non-religious listeners who simply do not respond to this type of music. As always, it depends on the quality of the music and the quality of the performances. Watkins’s liner notes do not indicate whether or not the published copies of these scores call for the number of voices used here, which range between 13 and 19. 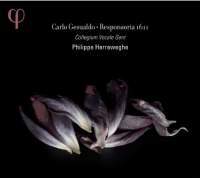 (Herreweghe’s choir includes six female singers.) Nevertheless, the group is splendid. It has that rare combination of good vocal blend, transparency of texture and excellent diction that made Longhini’s madrigal performances equally exceptional. Moreover, as Longhini’s high male voices blended perfectly with the lower ones, so do Herreweghe’s female voices blend perfectly with the male, including four countertenors (two designated as “altus” and two as “quintus”) with equally exceptional voices. Watkins’s dry but accurate description of this music says as much as I could, thus I will allow his words to stand for mine here. From whatever viewpoint you approach this remarkable set of discs, however, it is a gem to be cherished.